Despite the mounds of snow currently in the Tobacco Valley, we are inching towards spring. Days are getting longer. The sun, when it is out, seems warmer even when it is bouncing off the snow. There is even that sense that below the snow, small green shoots are getting themselves ready. Before you know it, in just a few months, we will see crocus coming up and the lilacs in the Historical Village will be putting out buds. We are still working on the Hawaiian fabric quilt that Joan pieced. Yes, it isn’t the easiest fabric to quilt and all the women are quick to point that out. At the same time, there are the bright colors and we are doing some lovely designs on it. The border has leaves that remind us of February hearts. At least that is what I think when I sit there appreciating the quilt and the quilters. Lynda pointed out to a visitor last week that some women can quilt and talk, while other can only do one or the other – not both at the same time. I am one of those who can quilt or talk. Actually even listening to a good story or some interesting idea requires me to pause in my sewing. Cathryn on the other hand can easily quilt, talk and listen, managing to do all three very well. I like to think it is a skill that comes with age. Most of the quilters here are in their eighties. A few are in the nineties and some others in their seventies, but eighties is our average. This is probably one of the criteria that makes this group so special. All those accumulated years of experiences, wisdom, taking care of babies and family, work, travel, love and hard knocks…so many things that polish a life, creating that wonderful patina. And when the women are quilting together on these wintry mornings, there is a glow that comes from their conversations as well as their silences. The visitor Lynda spoke with was encouraged to try quilting with us as she waited in the old school house for her car to be fixed. She said holding a needle would probably give her hives and we laughed at that one. And then different women started telling how they began to hand quilt, the wheres and the whys. All those threads that brought the group together here in Eureka, Montana, sitting around the quilting frame stitching hearts during a frosty February. It is official. We have stopped quilting for the summer as a group. Some of the women will work on quilts at home though. The other day I visited Cathryn and she nearly has the lovely orange one finished. Bev worked on the binding with Bonnie to compete the other one we had at the old school house. 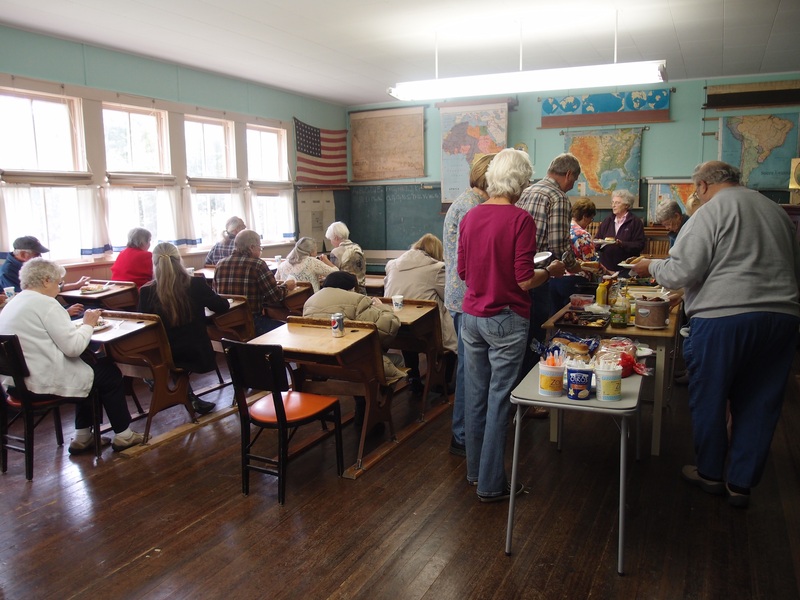 But now the schoolhouse has been decked out for summer visitors, looking like an old school inside rather than a place filled with quilting frames. Enjoying each other’s company though, we aren’t quite ready to stop meeting at least occasionally in the summer. Later in June all the quilters will gather for lunch and then a field trip to see the studio of a local sculptor. 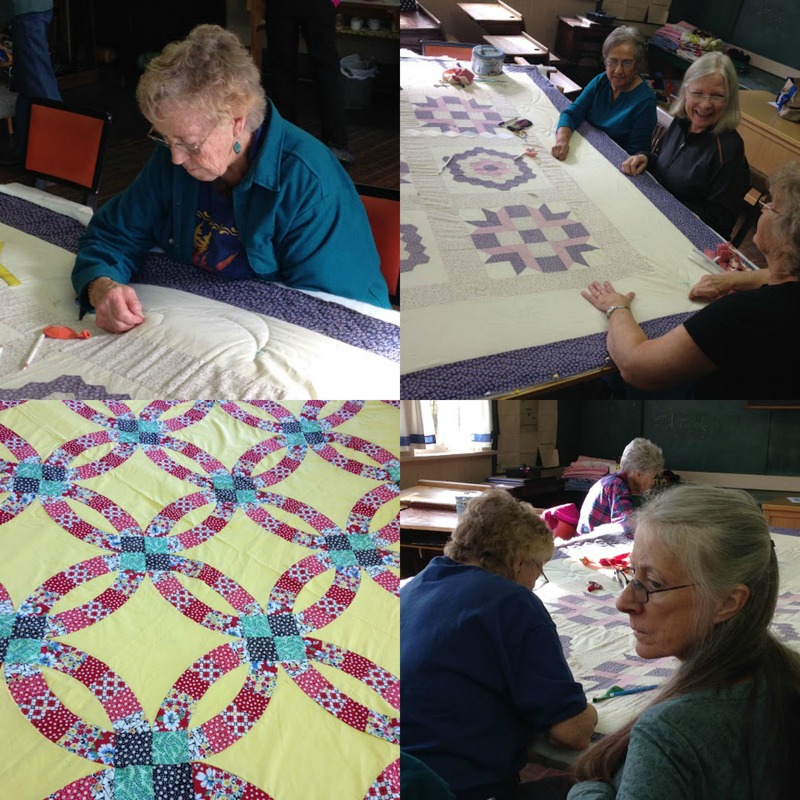 The reality is that even when these women aren’t quilting on Fridays, they are actively giving to their community in other ways. Mary Louise and Bev volunteer as docents at the Historical Village. Lynda commandeers repairs in the Village during the summer – the general store roof needs to be patched and the old caboose could use some fixing up. Cathryn was out planting flowers in the town’s park Saturday with the Weedettes. Judy is busy helping to arrange this year’s Quilt Show (August 6). Joan will help at the library’s book sale in August. It is understandable that not everyone has the time or energy to contribute to their community. But the amount these women give even in their eighties and nineties continually astounds me. And humbles me. They certainly set the bar high for what one can do to make a community a better place to live. Thanks. They really are terrific women.